True heavy metal, as it was meant to be, seems to be the base where conversations about forming a band began as far back as 2006-2007. 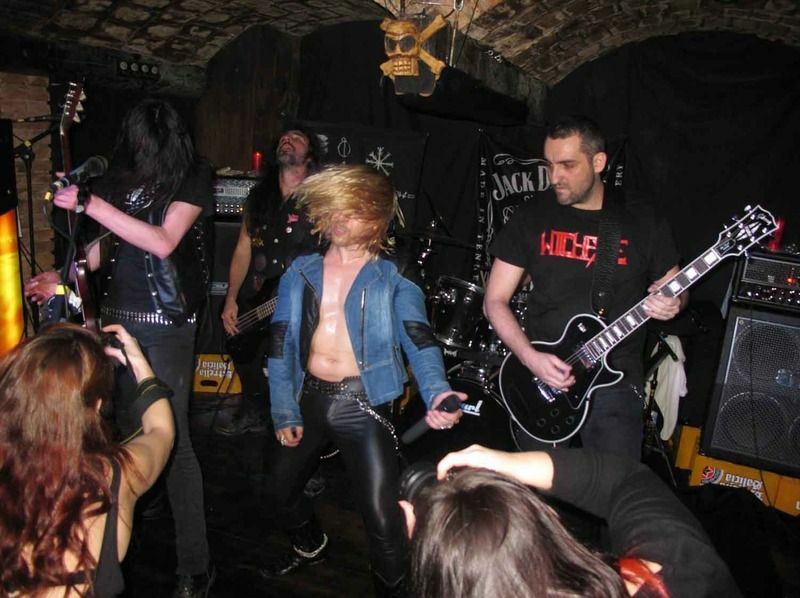 Things remained silent until 2011 when Witchfyre started working with the line-up of L. O'Witchfield (Balmog, Banished from Inferno, Marthyrium) and G.G. Andrews (Dantalion) on guitars, P.G. War (ex- Dantalion) on bass and J. Thundervil (Dantalion, Empty, ex-Mydgard) on drums. The new formed band spent the entire 2012 writing songs and searching for the perfect individual to fill the vocalist spot. 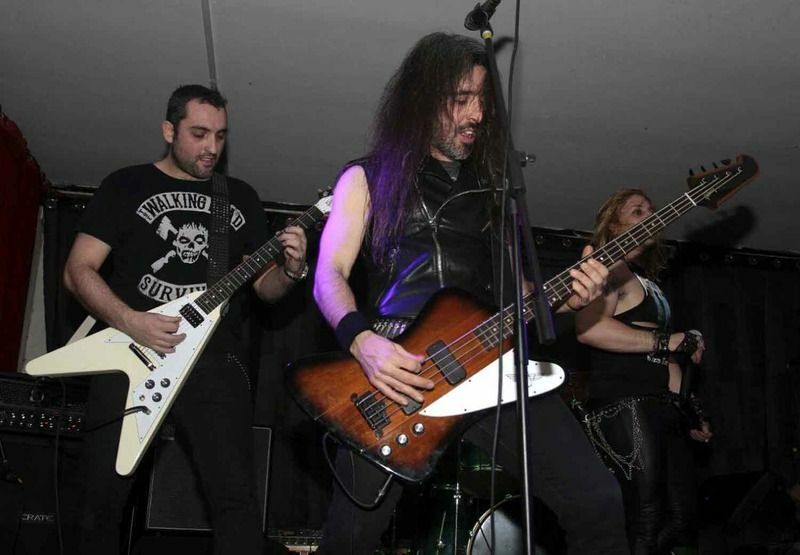 After checking some candidates, Emi Metal (ex-Ardegan, ex-Trial) joins the line-up, lending his talents to the first songs that the band has already written. Finally, in early 2013, Witchfyre hits the studio to record their first work, which will see the light of day as a 7” EP soon to be unleashed. The band is currently looking for a label to release five more songs, recorded in the same studio session, as an MLP and MCD, and preparing their first live assaults. Beware of the Witch! Peer at Fighter Records' catalog on Bandcamp if you'd like to see album covers made in the grand old heavy metal style: Mighty-thewed barbarians with scantily-clad women clinging to their legs, triumphant warriors ripping off their enemy's heads, and guitars with lightning coming out of them. 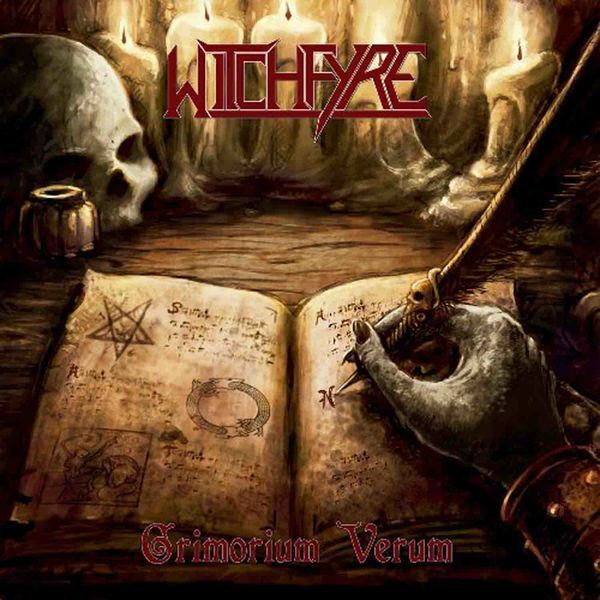 Or, in the case of Witchfyre's debut LP, Grimorium Verum, a book of dark magic in the process of being written. So what witchcraft does this new Spanish band have in store for us on this album?As it turns out, something a lot more English in origin than Spanish, though the band does a good job of presenting it, in the form of heavy metal with a NWOBHM flavor that sounds like it comes from the early 80s -- falsetto screams and all. For those who liked the depressive band Dantalion, which I reviewed back in 2014, one can expect similar instrumental excellence from the band despite the completely different musical style, since everyone except the vocalist is either a current or ex-member of that band. They don't disappoint. 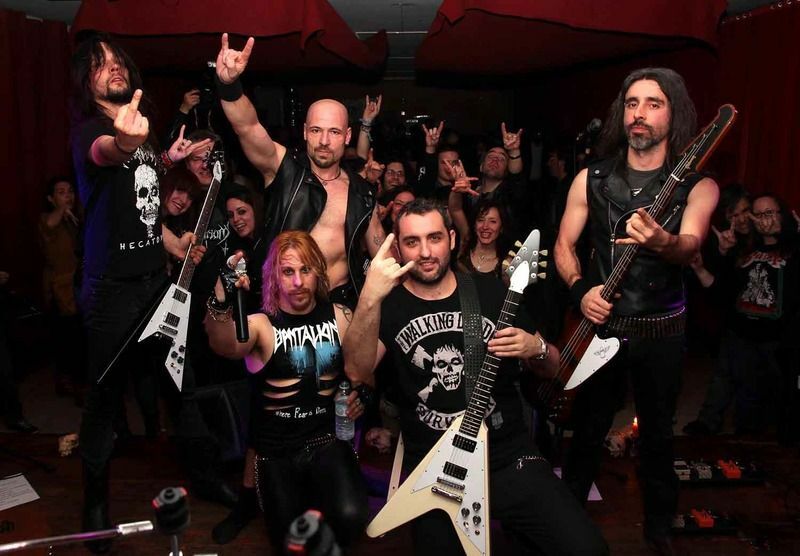 Bands like Portrait and the (alas) on-hold Johnny Touch interpreted NWOBHM with razor-sharp production and modern guitar shredding; Witchfyre approaches its subject matter with a similar sound, but it's done in a less flashy way. Retro but quick-moving, it provides plenty of stabbing little riffs and rhythm change-ups. Snappy, unindulgent tracks are the order of the day, with No Rest for the Witched being one of the standouts. If vocalist Emi Metal, who can change his smooth tenor to a ragged scream easily enough, could also hit low octaves, I'd be thinking of King Diamond; but he seems to know he can't get away with vocal extremes and sticks to what he's best at.As it is, the band certainly has a good bit of influence from Mercyful Fate, but it's neither a clone nor a one-trick pony, and its members know how to make both tunes and soloing memorable. There are plenty of breaks for both changes to the rhythm and for two-guitar soloing that is a delight to the ear. Some of the strength at writing song intros that characterized later Dantalion also is translated here into old-school heavy metal form, and the album is the better for it. Nor are speed metal themes abandoned; Night Hunter would be perfectly at home on a second-tier 80s album, screams and all, and in it the band provides cheap thrills for the retro-seeker while capping it off as the shortest track on the album. Queen of the Night is another favorite of mine. A jerky guitar rhythm, more trot than gallop, gives way to a traditional doom swing, done at high speed. By the time the solos start taking over, the listener is very likely hooked.Grimorium Verum is strong in its own right as a debut, and the abilities of the Spanish metal veterans who started the project deliver the goods. If you like Portrait or Harbinger, you'll probably enjoy this one too.